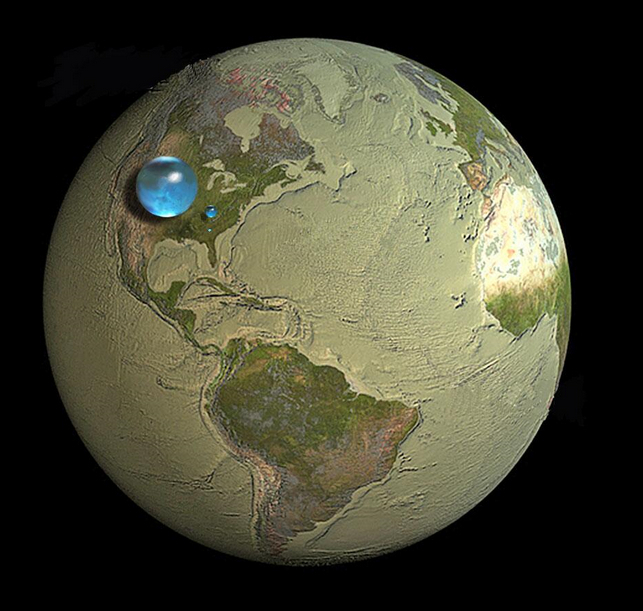 There is a lot of water on Earth – an estimated volume of 333 million cubic miles. So why do humans have difficulty in finding the water we need? Total Global Water. Very little of the 333 million cubic miles is freshwater (2.5% – 2.5 of every 100 units, or about 8 million cubic miles). Most water is found in our oceans. 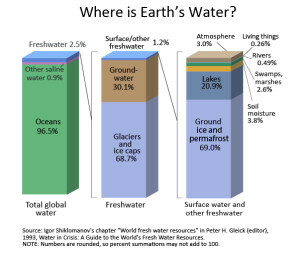 Of the Freshwater, very little is surface water (1.2%, or 0.03% of the overall total – 3 of every 1 million units, or less than 100,000 cubic miles). 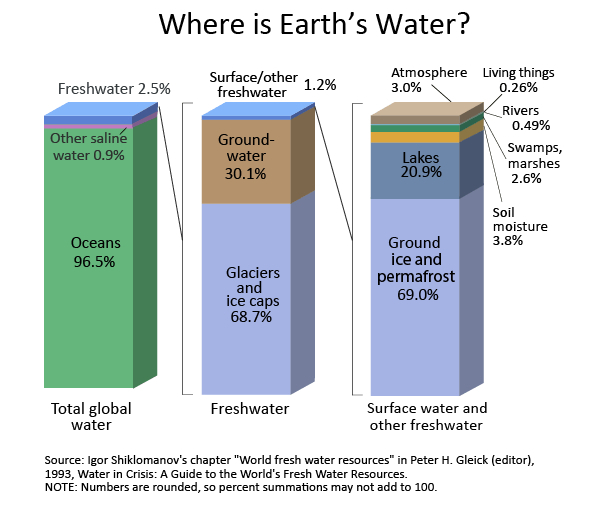 More than half of all freshwater is found in glaciers or ice caps. Of Surface water, lakes, rivers, and swamps – the primary source for human consumption – are a minor portion (24%, or 0.007% of the overall total – 7 of every 1 billion units, or less than 25,000 cubic miles). 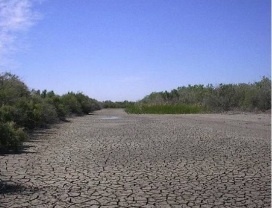 More than half of all surface water is found as ice or permafrost. Here’s another way to look at the same data, created by Jack Cook of the Woods Hole Oceanographic Institution. The same three categories of water are represented by appropriately sized spheres or bubbles of water. The largest sphere (sitting on the Midwest section of the US) is Total Global Water (~333 million cubic miles), the medium sized sphere (over the State of Kentucky) represents all liquid Freshwater (excluding glaciers and ice ~2.5 million cubic miles), and the smallest sphere (over Atlanta, Georgia) represents liquid fresh Surface water (~.02 million, or 22 thousand cubic miles). 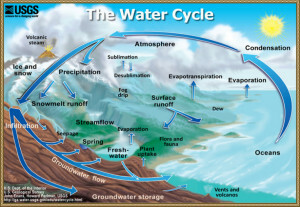 In addition, most water on earth is in motion from one place to another, and often also from one stage to another – ocean to vapor to precipitation to surface or groundwater and eventually back to ocean. 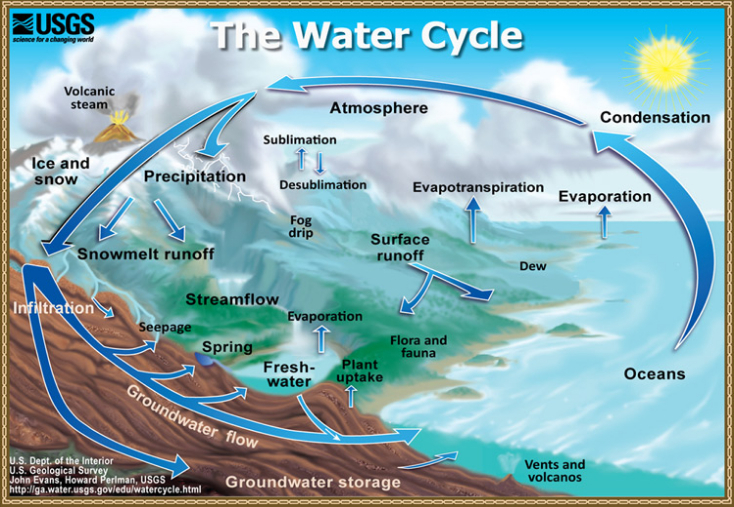 The water cycle. No wonder we often have difficulty finding the water we need.